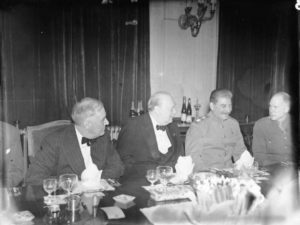 The Potsdam Conference in 1945: President Truman (L), British Prime Minister Churchill (M), General Secretary Joseph Stalin (R) sit down at a meal to negotiate the end of WW II in Europe. Over time, Peace At The Table will be posting stories that have been submitted and shared by people from around the world. These are stories about peace that have grown over a meal or drink that they have taken part in or witnessed. We are requesting that our readers share their stories. Click here to find out how you can. These stories can be anything from two people sharing a cup of tea or coffee, to families, to large groups discussing issues or anything else over a meal or drink that nurtured peace. These stories need to be told. The world needs to hear news and stories about healing and building peace – now more than ever. These stories can help. Please click here to read our Today’s Story: At Nana’s Table.